About a month ago we got the fourth volume of Papercutz’ series called Disney Graphic Novels, and the first one under the logo title Great Parodies. 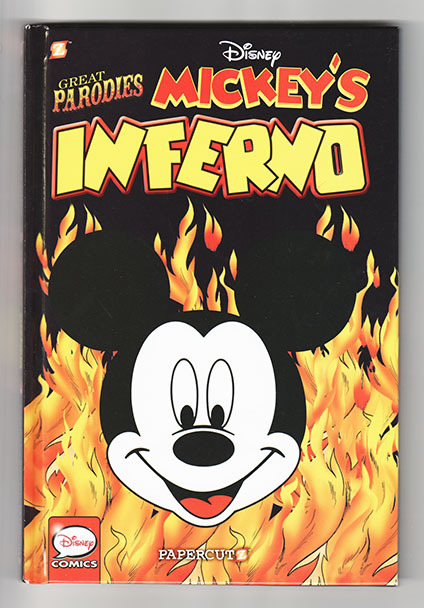 But the actual title of the book and the story inside is Mickey’s Inferno. Mickey’s Inferno was originally published as a serial in the Italian Topolino way back in 1949 and was the start of a long series of Italian parody stories adapting classic literature. And this story is a parody of Inferno, the first part of Dante Alighieri's 14th-century poem Divine Comedy. Written in rhyme it’s hard to do a direct translation of the comic story, so the English translation is more of a script adaptation than a real translation. 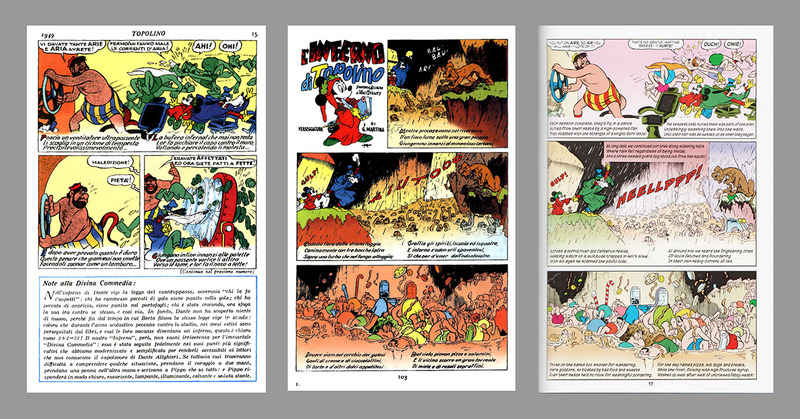 I don’t know much Italian, so I can’t do a comparison to the original text – but we now have two different American editions of this story so it’s fun to do a little comparison of those. The first American edition was a cut and remounted version in Gemstone’s Walt Disney's Comics #666 in 2006. And the text in Gemstone’s version is quite different from the one in Papercutz’ book. The Gemstone version got an entire sequence of the story cut out, but the Papercutz’ one is actually not 100% complete either. Even if the total number of pages is a few more than the original Topolino serial, a few panels are cut and others are extended. Under is the last page of the first part and the first page of the second part as they originally were printed. 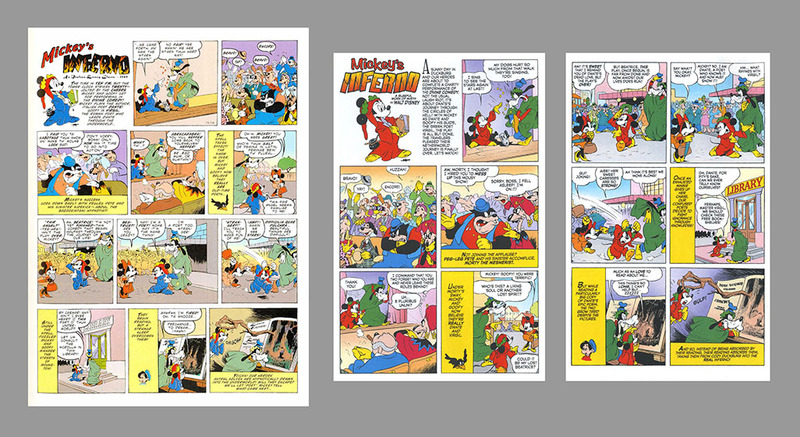 In the 1-part version used by Papercutz the panel with Goofy about to be chopped to pieces is cut out and the intro panel for the second part is cut too. I planned to write about this a month ago, but I don't have too much to say about the story itself really. Generally I'm not a huge fan of the Italian parody stories. This is probably the single Italian story that MUST be read in Italian: the verses(which any Italian kid of the 40s\50s would know are to be read before the balloons, which in turn are often rhymed themselves) are wholly written in hendecasyllable like the original Commedia and it's full of play on words mostly untranslatable. And massive amounts of Italian references. I'm sure there are a lot of interesting things to say about the story, so I wish someone with knowledge about it all could write an in-depth analysis. That I'd be interested in reading. Maybe such an article exists too, but probably just in Italian. "And this story is a parody of Infero, the first part of Dante Alighieri's 14th-century poem Divine Comedy": there's a typo, it is "Inferno" and not "Infero".